Today is a dreary rainy day, so I figured this would be the perfect recipe for today. Enjoy! Season beef with salt and pepper. In a large pot , heat oil over high heat until lightly smoking. Working in batches if necessary, add beef and cook, turning occasionally, until well browned on all sides, about 5 minutes per side. Transfer to a large platter. Add carrot, onion, celery, and garlic to pot and cook, stirring and scraping up any browned bits from the bottom, until lightly browned, about 6 minutes. Scrape vegetables into a heatproof bowl and set aside. Add stock to pot, return to heat, and scrape up any browned bits from bottom of pot. Meanwhile, cut beef into chunks and add to pot, along with reserved bones, if using, and herb sachet. Bring to a simmer, then reduce heat to maintain a low simmer and cook until beef is tender, 1 to 2 hours; skim any foam that rises to the top. Discard bones and herb sachet. Add barley, reserved vegetables, and fish sauce, if using, and simmer until barley and vegetables are tender, about 30 minutes. Season with salt and pepper. If soup is too dry, top up with water to achieve desired consistency. Serve, garnishing with parsley. Enjoy! 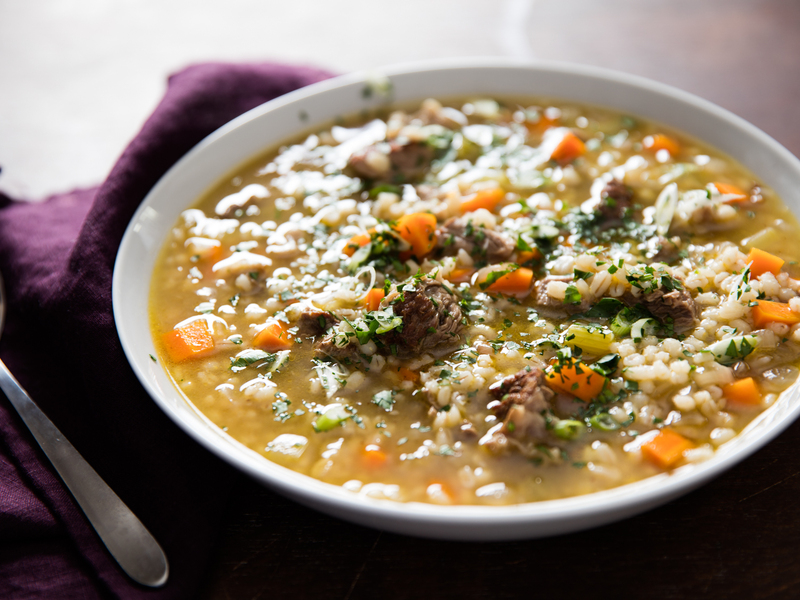 What’s your favourite soup recipe for rainy days?